Do you believe that extraterrestrials have visited the Earth? If so, you are not alone as more than 48 percent of your fellow Americans believe the same.1 And if you have more than just a passing interest in the subject, then you will already be familiar with the mother of all UFO stories – the strange events that occurred in July 1947 outside Roswell, New Mexico. dwarves onboard into U.S. airspace, to the more prosaic explanation offered up by official military sources that a Top Secret U.S. Government balloon project that could sniff out atomic blasts was being covered up. I do believe that little green men were behind the UFO events of the summer of 1947, but not aliens from other planets, rather the type of little green men that I remember playing with as a young child – plastic toy soldiers that I sent to battle in my back yard. Except in this story, real life military members were the orchestrators, all of them battle hardened from World War 2 and willing to do anything to prevent another World War. Extraterrestrial (ET) UFO proponents and enthusiasts will balk at this theory - after all they believe that Roswell is the most researched ET UFO event in human history and the official paper trail of Government documents they have uncovered and the sworn affidavits of first hand, second hand and third hand witnesses they have collected, all lead to their diehard conclusion that visitors from outside our planet crash landed in the desert outside of Roswell. I discount the alien crash theory because at its core it is based on anecdotal evidence collected decades after the fact and it is a hypothesis that is not subject to the scientific tenet of falsifiability – that is a for a theory to be proven, there must be a way to disprove it as well. If your mind is already made up on which theory makes the most sense to you and you don’t feel an alternative explanation can be considered, then read no further and pass this book on to someone else. But if you have an open mind and are willing to entertain another plausibility, then please read on and I will do my best to keep you focused and engaged. I call this theory the Human Deception theory and to understand it, you will need to place yourself in the shoes of 1947 U.S. Cold Warriors whose existential fears were borne out of a different time and place, one where the U.S. was perceived to be under constant attack by outside forces bent on its destruction. A time when communist spies, saboteurs, and agent provocateurs were envisioned behind every corner - the U.S. fighting a perceived cancer from within that threatened to consume the American way of life. This life and death struggle were attributed to the perverse machinations of a Communist International, championed by the Soviet Union, and hell bent on supplanting American capitalist society with a communist one. To fully understand the players, motivations and methods involved, I recommend first reading my free book Anachronism2 where I show the same players in similar roles in 1946 and who then reemerge in this story in the spring of 1947. 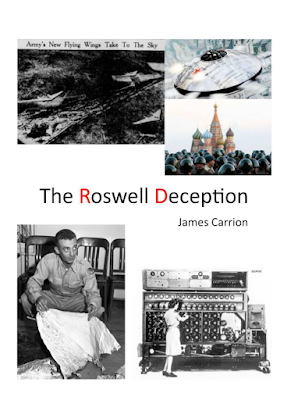 But if you prefer to start here, then join me in this narrative as I peel away 70 years of human deception to expose an incredible secret at its core – that the flying saucer summer of 1947 was the grand stage for what I call the Roswell Deception. "...the 'leaked' revelation that the Soviet Union flew a high performance Nazi engineered craft with dwarves onboard into U.S. airspace..."
ROFLMAO!! As though doctors and scientists (in ANY country) wouldn't know what a "dwarf" (by which, I assume, they mean a "little person") looks like!